Art Basel, the world’s largest art fair held in June every year, celebrated its 40th birthday this year. More than 300 world’s topnotch galleries strictly selected from 29 countries out of more than 800 galleries around the world, gathered here in Basel. Works of approximately 2500 artists were exhibited and welcomed 61000 visitors in total. The three-dimensional object placed almost in the center of the venue is brought from Presenhuber, a gallery in Zurich. It was a work by VALLENTIN CARRON, a humongous black cross that stood straight up in the blue sky of early summer. Swiss newspaper, Neue Zürcher Zeitung, commented, “In front of the exhibition building at Basel a black cross towers to the sky, as if the Art Basel would be brought to a grave at its 40th birthday. But the fatal event did not happen!” and reported a great success despite the effects of the sluggish economy. Brad Pitt in jeans dropped in casually, and Gunter Netzer, a soccer player living in Zurich showed up, and Naomi Campbell and Karl Lagerfeld came as a couple. All the shots were flown around the world the following day of the Preview. Ultrarich Russian, Roman Abramovich, was one of the visitors, as well as the directors of the world’s major art galleries, including, of course, MOMA, Pompidou and the Louvre. Private jets carried all the top-class collectors around the world to this venue in Basel. Although there are less number of galleries from the USA compared to the last year, the list contains big names such as Blum & Poe, Matthew Marks Gallery, Richard Gray Gallery and so on. As we expected, those that still have effective magnetic attraction and raises the overall quality are galleries from Berlin, although they dominate in number as well. For example, nuegerriemschneider, Esther Schipper, Galerie Max Hetzler, Galerie Eigen + Art. Others include Kewenig Galerie from Cologne, and Galerie Bernd Klüser from Munich. Regulars from London are White Cube and Stephen Friedman Gallery. Others include Galerie Hopkins-Custot from Paris where Basquiat and Milo vividly stand side by side, and Hans Bellmer or Picabia. This is Galeria 1900-2000 that includes old masters. Kurimazutto from Mexico City stands out for its high level of quality. From Japan, Toio Koyama Gallery, Gallery Koyanagi, SCAI THE BATHHOUSE, ShartugoArts, and Taka Ishii Gallery joined this year as well. In the neighboring Art Unlimited, the exhibition is categorized by the name of creator and the artwork. Photographs, video works, as well as paintings, installations or huge 3-dimentional works are displayed. Any possible artworks in any possible forms are presented here. Lot of visitors go in and out of a small house, Torre de Málaga, created by Michitomo Nara, and it is one of the most popular artworks here. By the way, it is not well known that Zurich is, as a matter of fact, one of the principal hubs of modern art, such as Pairs, London and New York. However, it is a city that has developed various activities in the art history in the 20th century, especially from the middle of the 19th century, together with Basel where the Art Fair has been held. However, this queen is noble, beautiful and very clever. She has a great eye for art, can read the times, and she is a serious and dynamic strategist equipped with the marketing abilities that can lead the market. While the visitors saw “Foundation Beyeler” as the first booth on the right when you entered the first floor of the venue, which gave the prestigious impression to start with, noble tension and intellectual restraint were felt in the overall atmosphere of the floor. Each gallery booth demonstrated very sophisticated show that could open its door right on the following day at any international city in the world, as it was as an exhibition. If not successful, they might have to forget about the next year. Therefore, every gallery had strong concept and clearly displayed its theme. They were provocative for the viewers. Art 40 Basel has been recognized as a humongous success despite the low expectations. Guesstimated figures of the sales are still up in the air. Various people who are involved in modern art, such as artists, top collectors, curators and media, gathered together or encountered for the first time. It appeared like having a big wave of the times that brought about the leading-edge interchange of art-related people. When I went to Paris for the first time, I included, without question, a schedule to go the antique fair of Clignancourt. True to its reputation, tons of intriguing treasures were all over. Baroque tables or glasses of belle époque came into my view too carelessly. I was looking for a chair. I stared at one that I thought would make it. I imagined how it would look in my usual space if I took it to my home. No. This is definitely not the one. The lines and its volume would be too overwhelming in a Japanese room, and it would be impossible to keep a balance. I almost gave up the idea and just about to leave, the shop owner told me that there were more in the attic if I were looking for a chair. So I went up, and there she was. It was made during the time between Art Nouveau and the Art Deco, and delicately you could feel its stream. Before long, it traveled to Japan then to Asia. Then to Switzerland, it accompanied me all the way. I should clean it when I moved to Zurich. Whenever I saw properly restored antique furniture in European homes, I started to feel that way. Early summer three years ago, the owner of an antique shop in my neighborhood loved this chair the moment he saw it. “So this chair went for such a long trip from France to Switzerland.” It was made of ebony, telling it must have been carried over from somewhere in Africa. Given the map of the shop, I hurried to the fabric shop I was introduced. As I already had a certain image of the material, I chose the one I liked best among those solid colored ones shown to me. Those fringes are called “Gimpe” in the fabric term, I heard. I returned to the antique shop and together with the owner, we looked for the color for the legs. Although I was a bit uncomfortable to repaint into a different color, it turned out fine as a result. I waited for two months. The 100-year old springs were removed from the disassembled chair, and replaced with new ones. I understand that four craftsmen shared all the work from reassembling, putting on new fabric, to the final painting of the back and the legs. 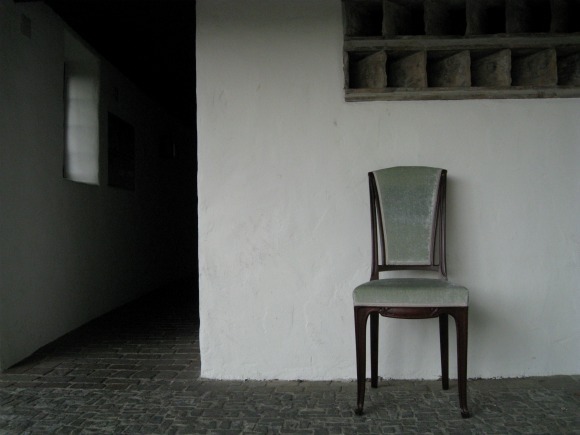 While different languages are spoken here, surely you find the scene where this chair blends in smoothly. Open to public from June 10, 2009. Art Basel, the world’s biggest art fair that is held in June every year. Artworks from North and South America,Europe, Asia and Africa are brought here. Approximately 300 leading galleries around the world gather together here,and display and sell the works from contemporary to modern art created by more than 2500 artists.